On Saturday, January 17, the Classic Car Show will return to FishHawk Ranch. It will take place in Park Square from 11 a.m.-2 p.m. Car Registration will take place from 10-11 a.m. It cost $10 for Car Pre-Registration at The Osprey Club and $15 day of the show. This is a free event for spectators and there will be a DJ and door prizes, food available for purchase and the proceeds will benefit the Emergency Care Help Organization (ECHO) of Brandon. Donations of canned goods, blankets and clothing will also be accepted for ECHO. There will be awards for Best Era Cars from: 1900 – 1909, 1910 – 1919, 1920 – 1929, 1930 – 1939, 1940 – 1949, 1950 – 1959, 1960 – 1969, 1970 – 1979, 1980 – 1989, 1990 – 1999, 2000 – Present. Looking for all makes and models. For more information, call Resident Services at 657-6629. FishHawk Ranch will also be holding another Market Day on Sunday, January 4. Bloomingdale resident Cheryl Kehrmeyer was presented the Laurie Ellis Mission Advocate Award in November at the Campo Family YMCA’s “A Night in Venice” themed Corks & Forks signature fundraising event. The award is presented annually to a volunteer of the Greater Brandon Area YMCA who embodies the YMCA mission, serves as an active ambassador, represents the efforts and vision of the YMCA, and promotes the healthy development of mind, body and spirit both personally and to the community. The Bloomingdale Homeowners Association (BHA) established the Best of the Best Student of the Month Program to recognize outstanding students in the community. If selected, the student receives a $25 gift card provided by our sponsor, Ray Chadderton of The Chadderton Group of Keller Williams Realty. Bloomingdale residents can send nominations to bloomingdale. homeowners@gmail.com or call 681-2051. Nominees must be in home, public, or private school and residents of Bloomingdale. Include the nominee’s name, address, phone number, e-mail and school attending. In addition, provide a short paragraph detailing why he/she should receive the award. Congratulations to Dana Dittfeld, December’s Best of the Best Student of the Month! Dittfeld is a senior attending Bloomingdale Senior High School (BSHS) and is a member of the Varsity Cheerleading Squad. 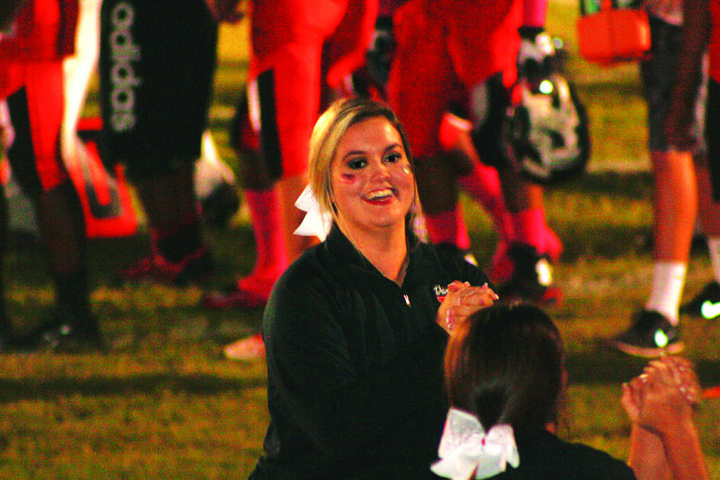 For 14 years, she has cheered for others; 10 years for the Brandon Bears Football program where she was part of an award-winning team and the last four years for the Bloomingdale Bulls. Now, her community is cheering for her. A rigorous cheerleading schedule leaves little time for other pursuits—Dittfeld spends two to three hours daily practicing or actively cheering for BSHS’s various sports teams. She is part of the select competition squad and in 2012 was voted Outstanding Team Leader by her peers. In 2013, she was named a Team Captain. Those who know her cite her leadership skill as strength. What free time this busy lady has is spent working on her college prep curriculum, which includes AP subjects and Florida Virtual School classes. With solid academics, her plans are to study nursing and attend a four-year college. After earning her nursing degree, Dittfeld’s goal is to work with pediatric patients. Her proud parents are Dave and Denise Dittfeld who reside in Somerset.